RO Silica Fouling: Hi-Silica feed water can irreversiblly damage to RO membranes. Magna Imperio’s END™ system efficiently handles hi-silica waters. Despite the tremendous advancements in water treatment technology over the past several decades, a handful of compounds remain significant challenges. Among the most challenging for water treatment systems is silica which can lead to irreversible fouling in modern (RO) treatment systems. Magna Imperio’s new Electrochemical Nano Diffusion (END™) process offers a simple and cost-effective solution for treatment of raw water and brine streams with high silica concentrations. One of the most ubiquitous naturally occurring compounds on earth, silica is present in almost every aspect of daily life from beach sand to electronics components. While extremely useful in many industries, dissolved silica remains one of the greatest challenges for RO and nanofiltration (NF) treatment systems. Left unaddressed, silica precipitation can lead to irreversible fouling of RO and NF membranes. Until recently, the addition of chemical anti-scaling compounds has been one of the only ways to help reduce silica fouling. While effective, such chemical anti-scaling methods are costly and can result in brine handling challenges for many sites. As a result, many sites with high silica concentrations are forced to operate at lower recovery while continuing to search for effective treatment alternatives. Recently, Magna Imperio Systems Corporation (MIS) has developed an effective solution for both direct treatment of raw water, or recovery of brine streams containing high concentrations of silica. Based on long-proven treatment methods, Magna Imperio’s new Electrochemical Nano Diffusion, or END™ process is a remarkable advancement in modern desalination which can deliver up to 98% water recovery, and 50% lower energy usage than competing RO treatment methods. More importantly, because of the unique operating characteristics of the END process, silica passes through the system rather than fouling the membranes, resulting in treatment of even the most challenging high silica water supplies. On a conceptual level, Magna Imperio’s END™ treatment process is based on the 50+ year old principals of electrodialysis reversal (EDR) treatment technology. The breakthroughs achieved in the END™ process result from the incorporation of contemporary membrane materials, advanced electrode chemistry, high performance spacers, and modern digital process controls to a long-proven process. Each treatment unit or ‘stack’ in the END system is comprised of alternating layers of cationic and anionic selective membrane sheets separated by spacers all of which are connected with common feed, permeate, and concentrate ports. Desalination is achieved by applying a DC electrical current across the membrane stack. The resulting strong electric potential causes dissolved salts in the feed water to migrate across the corresponding ion-specific membrane toward the oppositely charged electrode. As salts migrate through the system they become highly concentrated in the brine channels between the membrane sheets. Performance is maintained by periodically reversing the electrical charge (or polarity) to reduce potential fouling and further concentrate the brine. Because the process is electrically, rather than pressure driven, treatment performance can be easily controlled by varying the current and polarity reversal interval to precisely fine-tune treatment performance. The incorporation of modern process instrumentation and PLC-based controls yields a fully-automated treatment process with compact, highly modular form-factor. The advanced materials and automated controls of each END treatment process offer significant advantages for sites treating silica-laden water. Because the END process is electrically driven, operating costs are up to 50% lower than competing pressure driven RO and NF systems. Depending on volume and feed water quality, most END systems can be efficiently operated at feed pressures of only 15-75 psi. As a result, facilities can realize significant operating cost (OPEX) savings as compared to the pumping energy required for RO treatment. This feature also allows END processes to be very easily integrated onto the concentrate side of existing RO systems to achieve cost-effective brine recovery. The membrane geometry and low operating pressure of the END process also translates into simplified pre-treatment requirements versus traditional RO. Because feed pressure is relatively low, there is less concern of particulate fouling in the END process. As a result, END systems only require raw water pre-filtration to approximately 25 microns. By eliminating the need for expensive ultrafiltration (UF) pre-treatment, END systems can offer very significant capital cost (CAPEX) savings for new or retrofit installations. Lastly, Magna Imperio’s END process systems offer extremely high water recovery versus competing RO and NF treatment options. The advanced controls of the END process allow the electrically driven process to be specifically tuned to maximize water recovery while remaining unaffected by silica in the water. For treatment of groundwater and brackish water supplies with TDS concentrations of up to 1,500 mg/l, END systems can achieve recoveries of up to 98%. For more challenging brine recovery applications, recoveries of up to 85-95% can be achieved on feed water TDS concentrations of 4,000 to 12,000 mg/l. This ability to effectively handle a wide range in incoming silica and TDS concentrations makes the END process and ideal choice for sites looking to manage challenging raw water quality or recover water from existing RO and NF brine streams. Magna Imperio’s new Electrochemical Nano Diffusion, or END™ process offers many advantages for high silica treatment applications. 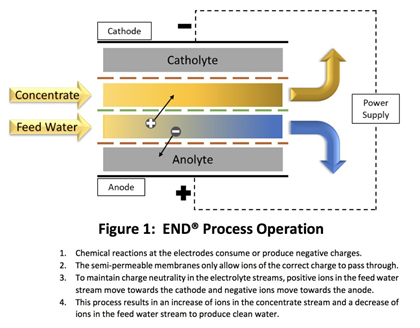 By leveraging the best aspects of proven electrochemistry with the modern materials and controls, the END process delivers extremely low-energy and high-recovery treatment of the most challenging feed water supplies. 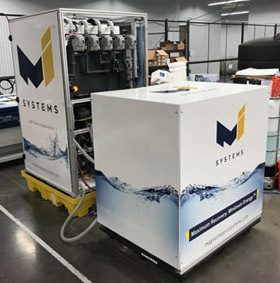 The modular design and fully-automated operation of each integrated END treatment process make it an ideal choice for sites looking to improve treatment performance, lower energy use, or achieve higher water recovery. 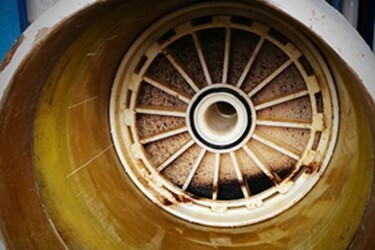 With proven results and a growing list of customers, Magna Imperio is putting an END™ to concerns about silica fouling.